Well, in sparks of the 2016 NBA playoffs me and my brother divulged into a 3 hour debate that lead us to this conversation. We started off discussing how the Houston Rockets could stand a chance against the Warriors in the first round of the playoffs. I’m a huge Rockets fan. I will explain how a “Florida Boy” was led to being a fan of the Rockets. Vince Carter, from my home town of Daytona Beach, FL led me to the Toronto Raptors. Thus, helping me discover Tracy McGrady. Which led me to follow Tracy to the Orlando Magics (since I was a big fan a Penny, Shaq, Grant, Dennis Scott, etc). After following T-Mac to the Houston Rockets and seeing T-Mac lose his mojo to injury I decided to rest at the Rockets. Okay, back to business. So while discussing how the Rockets, a team that literally made the playoffs on their last game of the season, could beat a team who broke the infamous Chicago Bulls 72-10 record, we some how led to talking about the heart of a teams and players. This is where I’m venerable because I love underdog teams. It’s something about the way I grew up that makes me love the underdog. It’s just the fire you see in their eyes and the adrenaline of whats on the line. It explains my mild resentment for a lot of teams that were built, like the Kobe-Shaq Laker squad, or the Big 3 in Boston or The Big 3 in Miami. There’s no amazement in these teams winning. Its almost like ” YOU BETTER WIN WITH THE DAMN TEAM! “. I feel like it’s so many great teams that never got the chance to win a ring because of these teams that were “super built” around a superstar. Some teams were just unfortunate and never got their time because of the reign of a great team in there conference. So I felt it in myself to acknowledge those teams. Here’s the catch though…I want people to tell me who was the BEST team to never win. Disclaimer : I was born in 1988. I only chose teams that I could actually recollect. Feel free to message or comment stats and teams and I will gladly add them in. I started in 1993. I ended in 2013 because a lot of the top contenders were starting to be repetitive. I chose these teams by the year and their roster at the time. So lets get to it! I don’t know much about this team besides the fact that Charles Barkely won MVP that year.With the help of Dan Marjorie the team went on to the the NBA finals where they lost to the Chicago Bulls. This team lost in the second round of the Playoffs to the great Knicks and didn’t even have a winning record in the regular season (40-42). But Muggsy Bogues was 5’3 135 lbs….for that fact alone, I have to put them in the mix. That is simply incredible! Muggsy finished #4 in assists total that year, #10 in steals, while Alonzo Mourning finished #4 in total blocks. Larry Johnson and Mourning combined for over 1600 rebounds. Charlotte would get eliminated by the Knicks in the second round that year. John Starks ( led the league in totals 3-pointers with 217) Patrick Ewing (#6 def. rebounder, #5 Lead Scorer , #4 points per game, #5 in total blocks) Doc Rivers, Charles Oakley and Anthony Mason made a dominant front running team. Yet, they faced some tough East Coast rivalries with Detroit, Pacers and Bulls always on their tails. When they finally made it to the finals they were beaten by Hakeem Olajuwon and the Houston Rockets in a close Finals series. The reason why I chose this team for 2 years is because in the 1995 season Orlando made it to the Finals where they were defeated by the Houston Rockets (repeat) with Shaquille O’neal being the lead scorer of the season, #2 in total rebounds, and #6 and blocks. The following year Dennis Scott broke the record for single season 3-pointers with 267. Along their side was Anfernee Hardaway, Nick Anderson, Horace Grant, Brian Shaw, and Darrell Armstrong. Great team, yet no ring. This is the year Gary Payton developed his alias “The Glove” leading the league in totals steals with 231. Shawn Kemp was #3 for total rebounds. Ervin Johnson & Kemp combined for a total of about 260 blocks. The team went on to lose in the Finals to Chicago Bulls 4-2. Karl Malone was the #2 scorer under Michael Jordan that year. He also finished #5 in total defensive rebounds. John Stockton finished the season #2 in total assists and #6 in total steals. The team as a whole finished #2 in scoring under the Chicago Bulls by 4 points, #3 in total steal, #1 in total assists right above the Bulls, and #1 in total free throws made. SHEESH! The only way to explain how they didn’t capture that ring is the controversial push Jordan did against Bryon Russell….real fans know the push. This is the year Dikembe Mutombo made a name for himself winning Defensive Player of the Year ( #1 in totals blocks, #3 total rebounds) and Mookie Blaylock landed himself at #4 in total steals that season. The farthest the team made it was the second round of the playoffs. No outstanding numbers from this team besides Rasheed Wallace‘s total number of fouls. The big 3 for this team Wallace, Arvydas Sabonis, Damon Stoudamire made a great front line. They would go on to get swept in the Western Conference Finals by San Antonio who went on to win the Finals. Reggie Miller, Mark Jackson, Rick Smits, Jalen Rose, Dale Davis, and Sam Perkins just to name a few on this roster. The only team that could stop them were the L.A. Lakers with their greatly stacked team. They lost the Finals 2-4. Allen Iverson, Dikembe Mutombo, Eric Snow, Raja Bell, Tyrone Hill, Toni Kukoc just to name a few on the roster. It really hurt to see them lose in the Finals to the L.A. Lakers. I think everyone wanted to see A.I. Iverson won MVP that year while Mutombo won Defensive player. Aaron McKie won 6th Man of the Year. I really just want to show you the line up for this team. Mike Bibby, Chris Webber, Vlade Divac, Doug Christie, Peja Stojakovic, Hedo Turkoglu, Bobby Jackson, Gerald Wallce. This team was nothing less than amazing. There was a lot of controversy talk around the Western Conference Finals loss to the L.A. Lakers but the past is the past. This team will not be forgotten, though. Jason Kidd had a outstanding year leading the lead in assists and also placing #5 in total steal. Unfortunately, Kenyon Martin and Jason Collins both made the top 20 for fouls that season and Jason Kidd was #2 in total turnovers. That would eventually cause there demise in the Finals against the well synced and experienced San Antonio Spurs. Kevin Garnett led the league in both points and rebounds that season and also was #9 in total blocks which led to his MVP vote. Sam Cassell placed #4 in total assists. With the help of Latrell Spreewell the led the team to the Western Conference Finals where they eventually were knocked off by the L.A. Lakers. Revisiting this team this time with a new roster. Reggie Miller, Stephen Jackson, Jermaine O’Neal, Metta World Peace, Fred Jones, Jamaal Tinsley just to name a few. As we all know, this was the year of the crazy “brawl” in the stands between the Pacers and The Fans that led to a lot of suspensions. Detroit went on to beat the Pacers in the Eastern Conference Finals and eventually went on to win it all. Even though the Mavs went on to win a Championship in 2011 it wasn’t this particular roster. Dirk Nowitzki, Jason Terry, Jerry Stackhouse, Erick Dampier, Josh Howard, Doug Christie, Keith Van Horn, DeSagana Diop, and Darrell Armstrong just to name a few. This team would go on to lose in the Finals to the Miami Heat led by Dwayne Wade & Shaq. Coming off a MVP season the year before and #2 in votes this year behind Dirk, Steve Nash finished the season #1 in total assist. Shawn Marion finished #1 in totals steals. Raja Bell finished #1 in total 3-pointers. Amar’e Stoudemire finished #11 in total points and with the help of Leandro Barbosa and Boris Diaw the Suns blew out every team in total points, finished #1 total team assist, finished #1 in FT & FG% and finished #1 in total team 3-pointers. I can’t even tell how they didn’t win a ring that year. The were defeated by the Spurs in the second round. The Spurs went on to sweep Lebron and Cavaliers in the Finals. As you can see I’m still in the 2006-07 season because I simply had to name both of these teams. Carlos Boozer, Deron Williams, Derek Fisher, Andrei Kirilenko, Mehmet Okur, Matt Harpring, and Paul Millsap led this team to the Western Conference Finals where they were knocked off by the Spurs. In the 2008 season Dwight Howard led the league in total rebound and placed #4 in blocks this season. Howard finished with about 1700 points, followed by Hedo Turkoglu with 1600, and Rashard Lewis with close to 1500. Lewis also placed #3 in total 3-pointers that season. Along with Jameer Nelson, Kieth Bogans, Keyon Dooling, J.J. Redick, the team was an offensive nightmare. The never made it past the second round. In the 2009 season Dwight Howard went on to win Defensive Player of the Year leading the NBA in rebounds and in blocks. Rasher Lewis led the league in total 3-pointers that season. The went to the Finals to lose 4-1 to the L.A. Lakers. Tracy McGrady played 35 games this season…pretty much sums up what went wrong for them. Yao Ming was #6 in total blocks and #8 in total rebounds that season. With the help of Metta World Peace, Lius Scola, Aaron Brooks, and Rafer Alston the team went on to lose a close series in the second round to L.A. Lakers. Mutombo, also plagued with injury, only played 9 games. Joe Johnson (1600 points that season), Jamal Crawford (1400), Josh Smith (1300), and Al Horford (1100) killed offensively. Its rare to see 4 players on one team score over 1000 points in one season. Add that with Josh Smith being #3 in total blocks the team was very diverse. Another great addition was Mike Bibby. As good as it sounds the team got swept by Orlando in the second round of the Playoffs. Jamal Crawford won 6th Man of the year while Josh was runner up to Dwight Howard for Defensive Player of the Year. I picked this team for 2011 because Kevin Durant won the scoring title and Serge Ibaka led the league in blocking. Russell Westbrook landed #4 in total assists. This year the fell short to Dallas in the Western Conference Finals in which the Mavs went on to win it all. Paul George won Most Improved Player of the year this season. Roy Hibbert was #2 for total blocks this season. As a team they were #1 in total rebounds and #5 in total blocks. Add in David West, George Hill, Lance Stephenson, and Danny Granger you had a squad who will not go out without a fight. In a tough Eastern Conference Finals they lost a 7 game series to Miami Heat who went on to win it all in the Finals. This is the 3rd time the Indian Pacers landed on the list…very unfortunate. Like I said I did’t go past 2013 because the teams were repeating between the Spurs, Miami, and OCK. Now…what team was the best. Which team was just really unfortunate but have the total number and stats to back it up. I’m curious to see some of the answers. This past Saturday , February 28th, Breakthrough MMA through one of the most action packed events in its history! New champions where crowned, while some champions remained elite! Austin McCray defeats Nesaw “Stay Thuqqn” Merriweather at 2:11 of Round 1 via Armbar and retains the Breakthrough MMA Flyweight Title. Stay tuned for his post fight interview on Keedie’s Corner! In an amazing main event upset Patrick Corrigan takes down fan favorite Sam Senuk in a comeback victory after being rushed early in the 1st round. He took the bout at the 0:43 mark of the 1st round via knee bar. We got a chance to speak with the new Bantamweight champion and this is what he had to say. In a great all out brawl Dominic Jones (6-0) defeats Deon “Light Out” Times 29-28 x3 to become the new Breakthrough MMA Lightweight Champion. Stay tuned for his post fight interview on Keedie’s Corner! Andrew Joseph takes down Keaton Shortt in a unanimous decision to become the Breakthrough MMA Middle Weight Champion. Stay tuned for his post fight interview on Keedie’s Corner! Keaton stepped in at short notice and we got a chance to speak with him,as well. Stay tuned for his post fight interview. We have a lot more post fight interviews coming your way. Check out some Photo Booth pictures we captured below! Here are the rest of the fight results courtesy of Zach Moore. Results for Breakthrough MMA 15 held on February 28th 2015 at the Ocean Center in Daytona Beach. 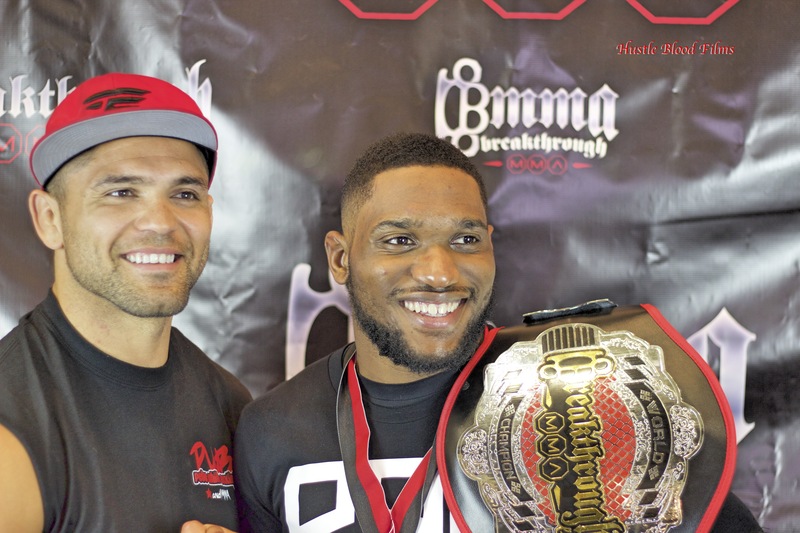 Jamal Thorne will now face Kevin Pace at BreakThrough MMA 16 on June 6th in the 135 lb Tournament Finals with the winner getting a title shot on BMMA 17. I also had the chance to get an interview with Breakthough MMA owner Jason Arnett so be on the look out for that interview as well. Thank you for tuning in to Keedie’s Corner Online Magazine and once again stay tuned for all post fight interviews!!! Thank you Breakthrough MMA for the great event!!! This Christmas Rich Homie Quan blessed the Axess Event Center stage as a perfect gift to his die hard Daytona Beach,Fl supporters. Checkout the pictures and video performance of his memorable performance.